Team France - Rob, our Napoleon made it easy to for me to identify him by wearing his 1804 pattern flag shirt! The Anglo-Allied Team. With Joe as Wellington, I didn't need any help identifying him; we've been friends and wargaming together off and on since 1973! Team Prussia; Mark, our Blucher, is the one in the rear rank - not exactly Vorwarts here, though! Table L after initial deployment - the city of Liege is in the foreground, and Von Bulow's IV Korps is deployed in its vicinity. I'm pretty sure James did the terrain for this table. Table C - the town of Ciney is in the distance, with Thielmann's III Korps seemingly deployed to move in any direction! Another of Joe's nice tables. Note the yeloow "C" label in the distance - this was a late but brilliant idea of James' to assist the GM in keeping track of which table was which - no small task given the random scatter and orientations of the tables! 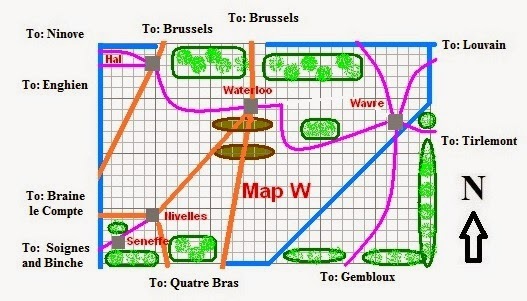 Table Q - Charleroi is to the right front of the table, with Quatre Bras to to the left front. 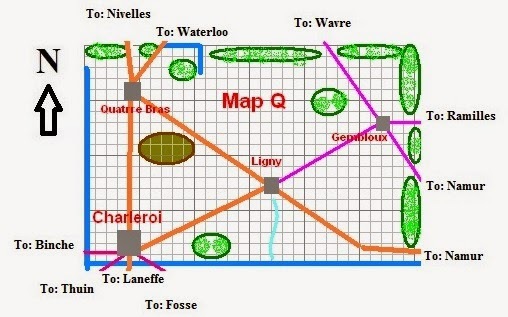 The great windmill model is Ligny, and that is Ziethen's I Korps deployed to its Southwest. Another of Joe's tables. The suspiciously empty Table W, with Waterloo in the center, and two small, parallel ridges to its South.. This one used my terrain. I have a La Haye Sainte model I was going to use for it, but I just ran out of time to find it on the day of departure! Table N - the town of Namur is in the distance, where Blucher and Pirch I's Prussian II Korps both begin. Another of my tables - I am very pleased with how my newest table cloth looks in this picture! Table R, with the city of Brussels in the foreground, and Picton's Reserve Corps. Table M, with the town of Mons to the far left (West). One of my tables. Empty at the start... but not for long! Table B, with the town of Beaumont.... and about 75% of the French army at the start of the game. Table T, with the town of Tirlemont in the distance. I don't believe anyone ever entered this table, although it could easily have been used at the end of the day. One of Greg's tables, I believe. Partial overview of the venue with the tables set up - the Miniatures Room of The Portal gaming space, part of The Time Machine Hobby store, in Manchester, CT.
SAnglo-Allied forces start to march onto the Waterloo table. 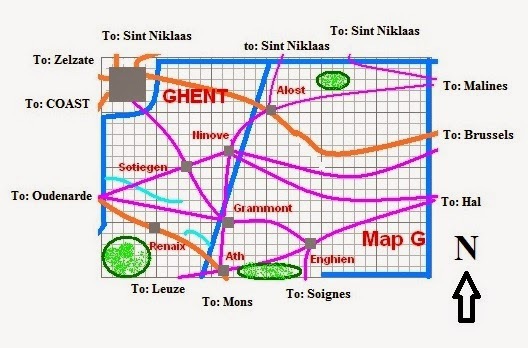 Anglo Alllied troops move out from Ghent an Ninove. Von Bulow's Corps ventures out from Liege. Look at that Artillery contingent. Great canon balls of fire! 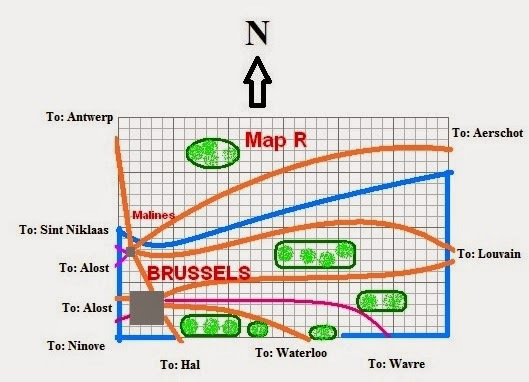 French (left) and Anglo Allied troops ()right) in a race for Mons! French congestion departing from Beaumont. Anglo Allied troops awaiting events near Brussels. Pirch's Corps also awaiting events around Namur. The French (Gerard's 4th Corps and Exlman's Dragoon Corps) have crossed the Sambre in strength at Charleroi, but Ziethen is ready to oppose them! Vandamme (played by Russ Lockwood, author of the Snappy Nappy rules being used for this "Campaign in a Day) deploys near Phileppesville. French and Anglo -Allied troops converge near Mons; With both in March column, it will be critical who gets the initiative next turn! as well as going to Hal and Nivelles on table W! A brief Prussian probe from Namur to Fosse ends with the Prussians heading back to from whence they came! With the congestion around Beaumont gradually thinning out, Drouot and the Imperial Guard set out on the March as well. Here's my best guess at the reconstruction of the opening moves of the Campaign; doubtless some (or many) of the details are off! Dark Blue = French Moves, Dark Red Anglo=-Allied, Dark Grey Prussian. Well, I've finally recovered enough from the hugely fun but also quite tiring day we had yesterday running this big event to start to post about it; there will doubtless be a number of posts over the next week or two. 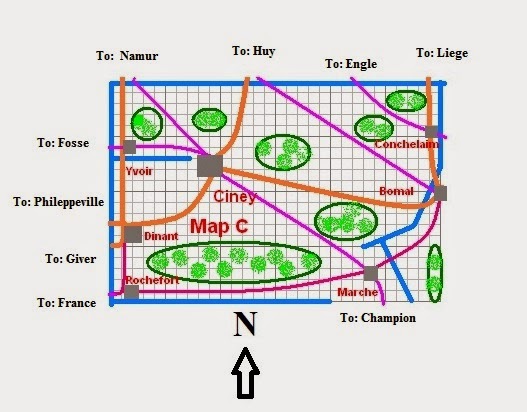 We'll start with the background information; the briefing for their army (only)was given to ALL of the French, Prussian, and Anglo Allied players several days before the event, once the commands were semi-finalized. In the event we had one player who had to cancel due to illness, and four (I think) same day walk ons; some 20 players in all, Because we had so many b[players, this allowed each arm,y to have a dedicated C-in-C with no direct troops to command. This is a very challenging position - extremely chaotic at first, and then calming down as the troops gradually get "stuck in" in combat. The players as listed were as planned as of Saturday; anyone who has a better handle on the final players, let me know and I'll uipdat the post. I believe. including ones from as far away as New Jersey and New Hampshire. As a result, Greg and James were "promoted" to assistant GM's. For me at least, this was a very Good Thing, as it was a big help to have couriers top deliver the flurry of messages sent back and forth, help with tactical rules questions, and the table to table "teleportation" of troops. You have escaped from exile on Elba less than 4 months ago, and regained the Imperial throne. In so doing, you've had to make compromises with both the Republican and Royalist factions, and have delayed re-instituting conscription for as long as possible. As a result, your army is smaller than you would like, but most of the men are veterans of previous campaigns. The rank and file are almost universally loyal to you, as are the Corps commanders, but some other officers may be suspect in their devotion to your cause. The Congress of Vienna has been bickering about the apportionment of territories and such almost since your abdication last year, and this has created mistrust between many of the members of the coalition, even though they claim to have put their differences aside to dethrone you a second time. You have decided to strike first at the nearest of the coalition forces - The Prussians under Feld Marschall Blucher, and the Anglo-Allied forces under the Duke of Wellington. 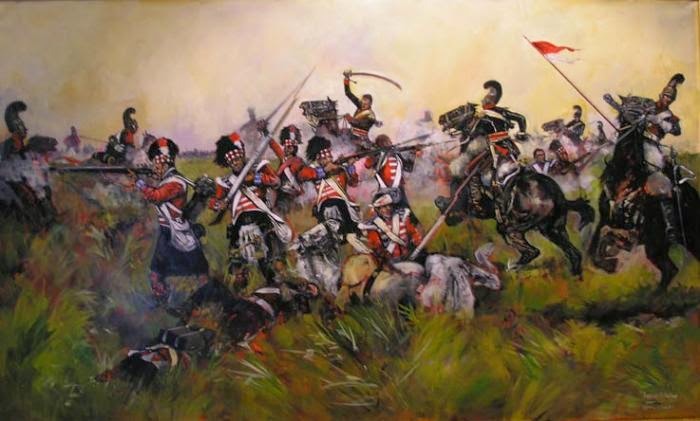 Together they outnumber you by about 50%, although you believe the quality of your troops to be superior, on average. In your own words "I'd rather fight a coalition than be part of one!" Wellington is known to be quite sensitive to his lines of communications with the Channel ports, which run through . Any French troops exiting West from there will require Wellington to detail twice as many troops of his own to counter the threat. On the other hand, "Divide and Conqueror" is the essence of your "Strategy of the Central Position". 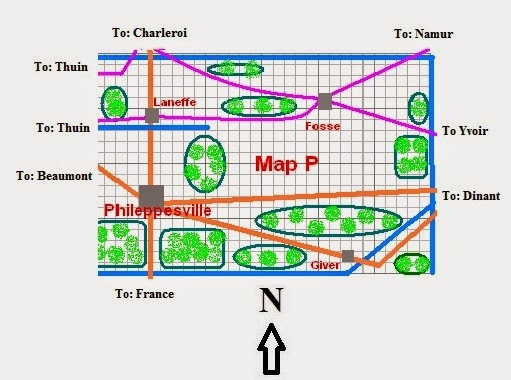 4th Corps (Gerard) at Phillipeville, extending North to just South of the river at Laneffe. You start at Imperial Headquaters, at Beaumont. You may issue such orders as you chose to your Corps prior to the start of the game. Vive l'Empereur! You have hated France and all things French since your Fatherland was humbled by Napoleon at the battle of Jena in 1806, and the subsequent Treat of Tilsit. Your general idea of strategy is to find the enemy and fight them. Vorwarts!!! You know the French are assembling on their border with Belgium, but their exact numbers location and readiness for action are unknown. 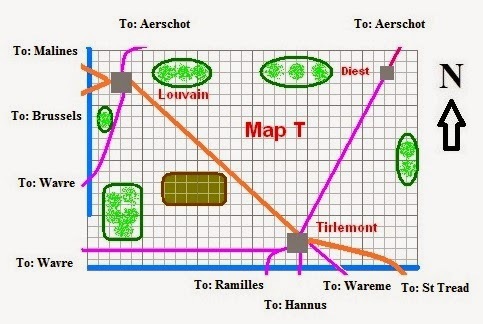 General Zeithen reports seeing many campfires South of the river Sambre, however. You have been forbidden to cross the border into France... at least until the hated French attack across it themselves. The Anglo-Allied forces have agreed to cooperate with you under the independent command of the Duke of Wellington. Until recently, the Duke was representing the British at the Congress of Vienna. His positions there seemed contrary to Prussian interests, causing many of your fellow officers, including your own Chief of Staff, to view him with great suspicion. Regardless, as long as he fights the French, you feel you can work with him. You have been appointed to command a polyglot host of British, King's German Legion, Dutch, Belgian, Nassau, Brunswick, and Hanoverian Troops. Many of the troops are untried, the Dutch and Belgians in particular having only recently been a part of Napoleon's empire. Even among your British troops, relatively few of them are Peninsular veterans, many of them having been sent to fight the Americans. Although you have defeated many of Napoleon's marshals in the Peninsula, you have never faced the Emperor himself. You know that he resents the tireless opposition to his rule fostered by your nation, and suspect that he would like nothing better than to crush your army if he can. Your line of communications to the North Sea ports is vulnerable, and you cannot afford to be cut off from it. 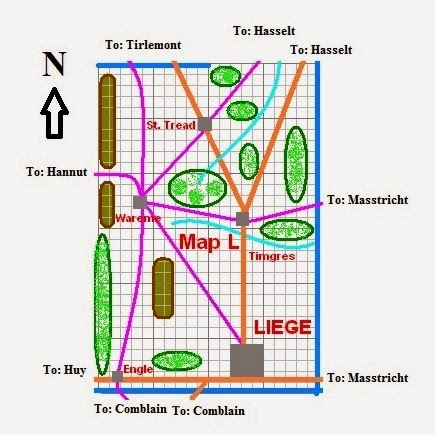 Should the French manage to exit troops down the roads from Mons to the North West, you will have to detach twice their numbers to protect your line of communications. You start at Army Headquarters in Brussels. All Anglo Allied forces start with "Defend" orders. You know that the French are massing South of the border, but their exact numbers, location, plans and readiness for action are unknown. Finally, you and many of your senior officers have a Ball to attend, hosted by the Duke and Duchess of Richmond in Brussels, and it would not do to show any signs of unease, lest it foster pro-French sentiment among the populace. God Save the King! * Legere units deployed in or attacking into (but not firing into) woods or structures count as being 1 Morale level better for all purposes (thus elite, 6) while and only while such terrain. Each of the eleven tables set up at the Portal had a small map with it (see below) showing the layout, with all of the towns labeled, all the road exits labeled as to where they head towards, and the direction of "North" on that table. The tables were set up in no particular relationship to the other tables, and the direction that is North was different from table to table. One large square is 1 foot on the tabletop. 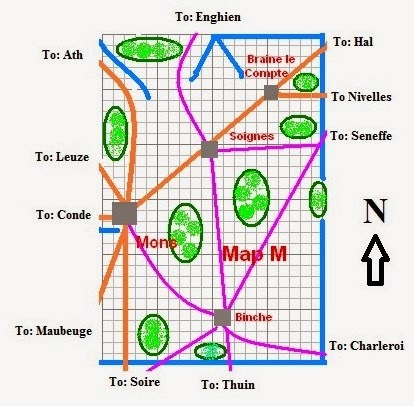 Thick orange lines are primary roads, thin magenta lines are secondary roads. Dark blue rivers are unfordable, Bridges exist wherever a road crosses a river; these may\ NOT be destroyed in the course of the game. Light blue rivers are fordable (rough Terrain). All woods are Rough Terrain as well (fire from or at units in woods only allowed at the edge (within 1") of woods. Hills are Broken terrain. The size of a grey square indicates City (3 buildings on tabletop), Town (2 buildings), or Village (1 building, most common). 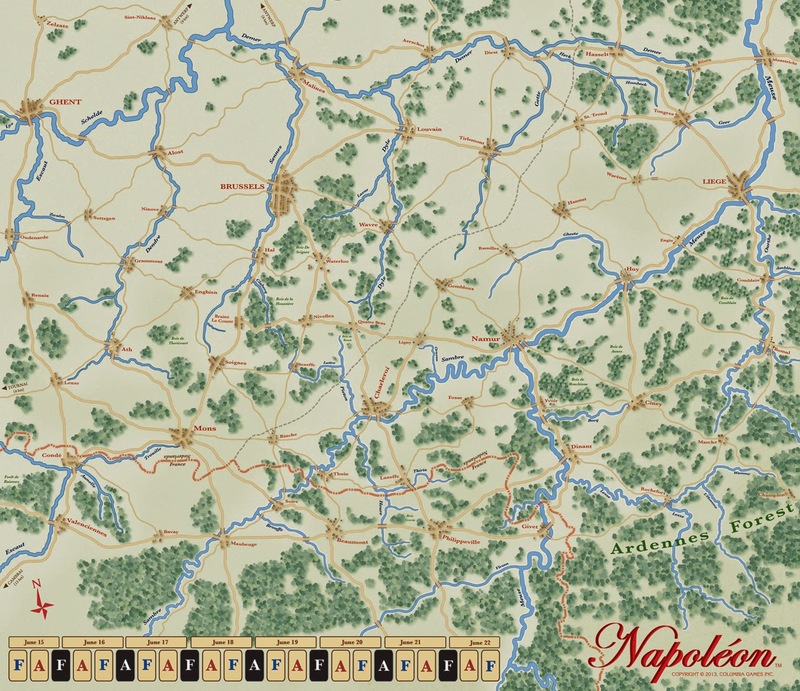 Here again is the map from the board game, "Napoleon". 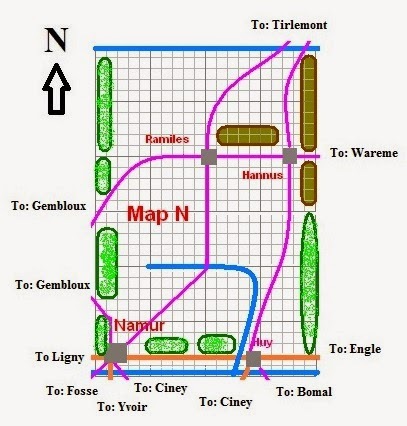 The table maps above were adapted from this, already somewhat abstracted format, and then further manipulated to meet the requirements of the multi-table format. . The players each had a slightly cropped version of the map for reference; in addition, Jam,es had 3 large size (18 x 24") versions printed off at a local office supply store for about $2 each =- a copy went to each army C-in-C to assist them with their command duties. 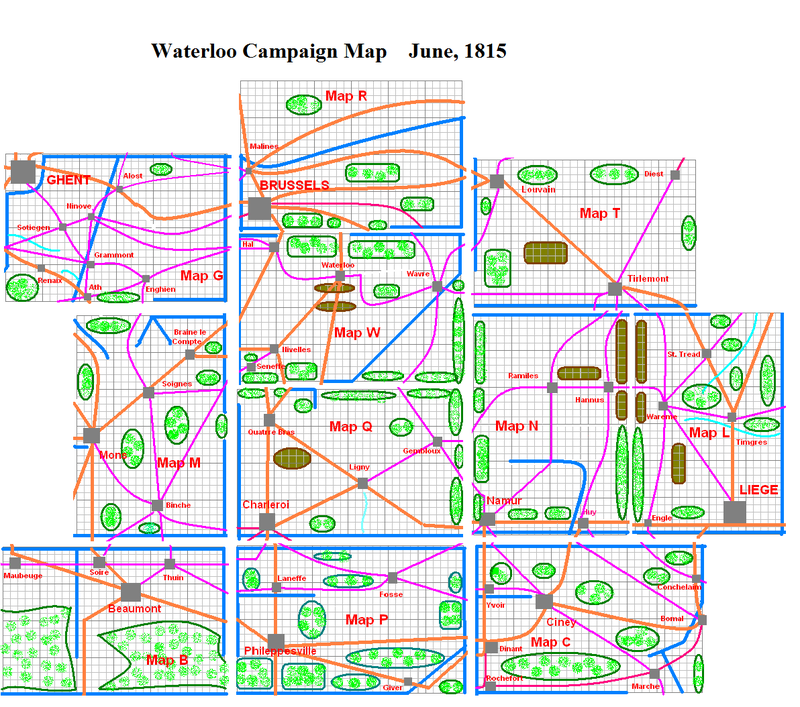 The Hartford Area Historical Gaming Society Waterloo 200th Anniversary "Campaign in a Day" event is now less than a week away! It will be held at The Portal gaming space of The Time Machine Hobby shop in Manchester, CT this Sunday, April 26th, from 10 AM to 5 PM. The painting of the very few last troops needed for the event will be done in the next few days. The full OOB's as originally proposed will be used. 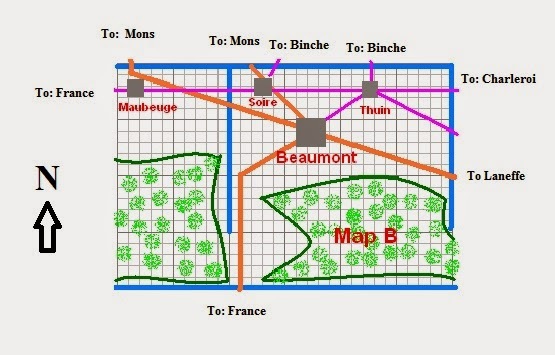 The layouts for the eleven 4 by 6 foot wargames tables that will represent the Theater of War on the border between France and Belgium are done, as is the umpire's Master Map that links them all together. The initial situation reports to be provided to each of the three armies French, Anglo-Allied, and Prussian, have been written and are ready to go out once the commands are set. Joe, Greg, and I will be bringing the 25mm troops for the event, and, along with James, providing and setting up the terrain on the individual tables. Our final task is to distribute the players to the three armies involved, and then the various individual commands. In addition, one player from each of the three armies will need to act as the C-in-C for that side - Napoleon, Wellington, or Blucher. Ordinarily they will also command the reserves, although it is now possible that one or more of the three the C-in-C's might just focus on their command duties - it is really quite challenging to act as both a Corps commander, having to maneuver your troops strategically and then fight tactical actions, while trying to keep track of both friendly and enemy forces, as well as issue them effective and appropriate Orders, prod them for reports and updates, etc!